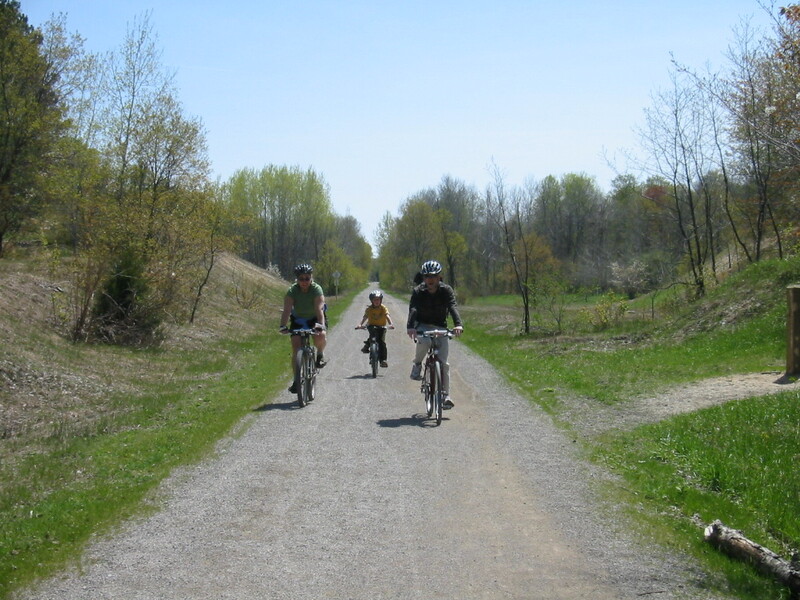 The North Central State Trail is a 62 mile multi-use rail-trail connecting the northern Michigan communities of Gaylord, Vanderbilt, Wolverine, Indian River, Topinabee, Cheboygan and Mackinaw City. The trail has a 10' wide packed crushed limestone surface and is open to all non-motorized users year round and snowmobiles from December 1 to March 31. 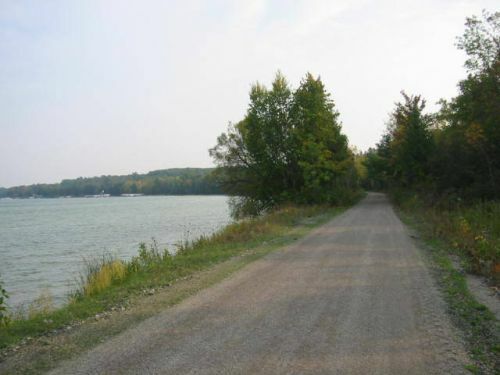 Location: A 62 mile rail trail that connects Gaylord, Michigan to Mackinaw City, Michigan. There are many access point between Gaylord and Mackinaw City off of Interstate 75. The trail can also be accessed in Cheboygan, Michigan just west of M-27 at the corner of Western and Taylor Streets. 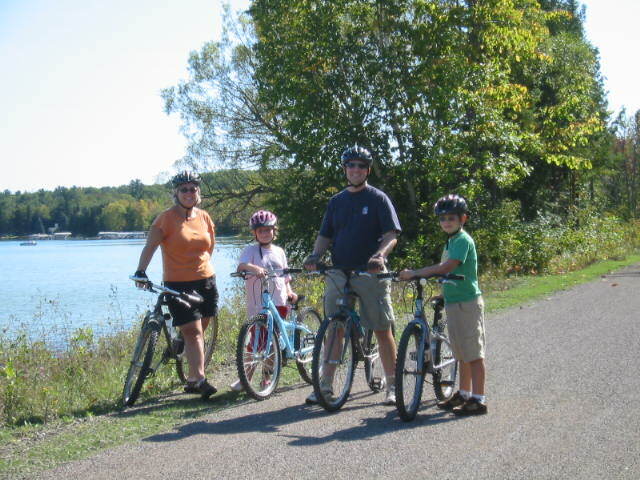 The North Central State Trail (NCST) is a 62 mile multi-use rail-trail managed by the Michigan Department of Natural Resources and endorsed by the Top of Michigan Trails Council, the Friends of the North Central State Trail and communities the trail goes through. 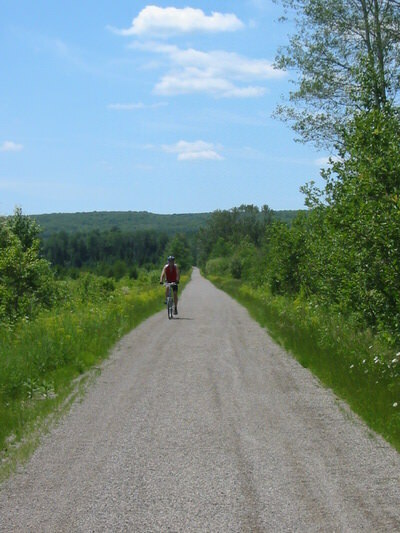 The trail surface is packed crushed limestone which is excellent for most non-motorized uses as well as snowmobiles in the winter months. The NCST was the northern segment of the Michigan Central Railroad built in the late 1800's. The terrain and the communities the trail passes through are unique and varied; it goes through rural agricultural areas, Mackinaw State Forest lands, along the Sturgeon River, the shore of Mullett Lake and parallel to the Straits of Mackinaw. The unique trail segments are described from south to north. Gaylord to Vanderbilt is 7.6 miles and goes through beautiful rolling farmlands with great rural views. The trail passes through two tunnels before it gets to the Village of Vanderbilt. The City fo Gaylord, known as the Alpine Village, has all modern conveniences and facilities. The Village of Vanderbilt, the gateway to Pigeon River County, has a store and restaurants. Vanderbilt to Wolverine is 10.9 miles and has the most remote section of trail, there are no access points or development for four miles. The trail goes through the Stewart's Creek Marsh where there is excellent wildlife and birding opporunties including elk and bear sitings. The trail crosses the Sturgeon River three times before it gets to the Village of Wolverine's Riverside Park. The Village of Wolverine has stores and restaurants as well as a canoe livery. Wolverine to Indian River is 9.6 miles and runs along and across the Sturgeon River. There are many river access site, views and great fishing opportunities. The trail goes through Haakwood State Forest Campground, Rondo Canoe Access Site and is about a mile from Burt Lake State Park. 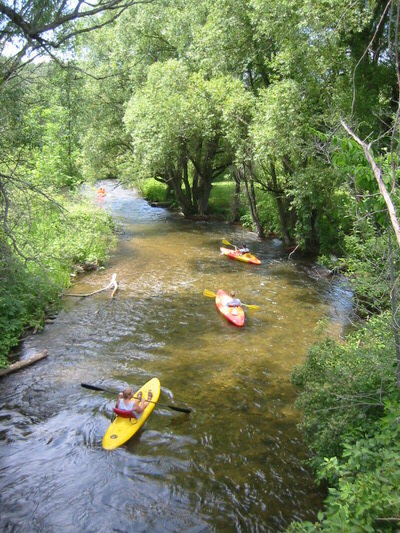 Multi-sport fun combining river and trail activities are possible. The town of Indian River, on the Historic Inland Waterway, has a modern trailhead, grocery store, hotels and restaurants, bike rental, canoe livery and ice cream shops. Indian River to Topinabee is 5.6 miles. 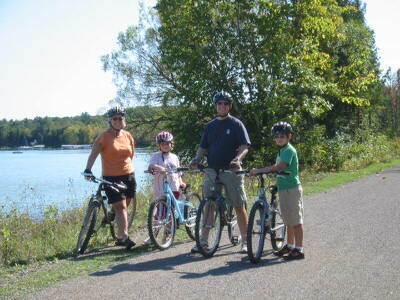 The trail crosses the Indian River and runs along Mullett Lake through forest lands and resort communities. 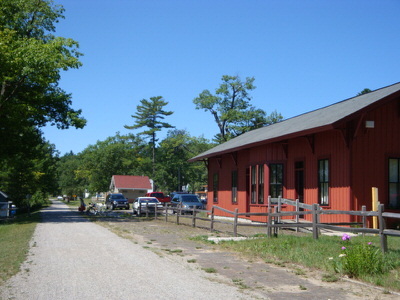 The small community of Topinabee, on the shore of Mullett Lake, has an historic depot and lakeside park. There is cabin rental, restaurants and a store. Topinabee to Cheboygan is 12.2 miles. The first 6.6 run along the blue green waters of Mullett Lake. Spectacular views and water access are available between the various developed resort associations. At the north end of the lake the trail turns due north to the City of Cheboygan through rural farmlands. In Cheboygan there is a modern trailhead facility and a picnic pavillion. Downtown Cheboygan, with wonderful parks, a Lake Huron beach, riverside restaurants, shops, hotels and a local brewery await a tired trail user. At the Cheboygan Trailhead there is a connection to the 71 mile North Eastern State Trail, which runs southeast to the City of Alpena. Cheboygan to Mackinaw City is 16.3 miles. The trail goes through varied types of forest lands and runs parallel to US-23 and the Straits of Mackinac. The trail runs right through Mill Creek Historic State Park and has access to a wonderful roadside park with excellent views of the Mackinaw Bridge. The trail terminus is at a modern traihead facility in the Village of Mackinaw City with a beautiful stone pavillion. The trail within the Village has a paved 12' wide asphalt surface. Hotels, shops, restaurants, historic sites, lighthouses and parks awaits the visitor in fun filled Mackinaw City. At the Mackinaw Trailhead a trail user can also head southwest on the North Western State Trail (currently undeveloped) to the City of Petoskey. In Mackinaw City a trail user can catch a ferry to historic Mackinac Island where no motorized vehciles are allowed, an experience that should not be missed.